Those who lost track of the latest Marvel super-event, Siege, may be surprised to see the much-ballyhooed New Avengers series drawing to a close after just over five years of publication. Truth is, even those who closely followed the series have a good reason to feel surprised, since the book never really seemed to reach solid footing. This unusual pairing of solo heroes, borrowed members from other squads and forgotten faces was always changing bases of operation, dodging proponents of the Registration Act or cleaning up after the latest crossover event. The team rarely enjoyed self-contained adventures of its own, although the promise of that kind of establishment seemed to be constantly looming just over the horizon. Well now the Act is in doubt, Norman Osborn has been removed from power and it's a new day for both the Marvel Universe and the Avengers themselves. So, naturally, that occasion needs to be commemorated with a new #1 and New Avengers was one of the lucky titles marked for cancellation. I guess those halcyon days we were all looking forward to will never arrive, at least not under this banner. Seems like the whole purpose of this little epilogue is to mop up some lingering bits of plot grime, tie up (or snip off) a few lingering loose ends and generally just chill with the old team one last time. If that sounds pretty close to the status quo, well, it is… but writer Brian Michael Bendis has scattered enough little tidbits around the issue to make the whole deal feel much more like a transition and less like a continuation. Take Luke Cage's speech to the exhausted squad of confused Avengers, for example. Out of context it just sounds like another chance for Bendis to work in a bit of his trademarked realistic dialog. Bear in mind the talk of Cage heading a new team of Avengers, however, and you'll take notice of both the mobilizing effect that speech has on his teammates and the knowing grin smeared across Captain America's face. There's also about twenty pages of pure, balls-out action. Over the course of this series, I don't think there's been a single occasion where the team met up with someone who could stand up to the sheer force of their combined powers, let alone one who could take it without disintegrating into a million tiny pieces. In their final hours together, just such an opponent falls right into their lap and the team is all too happy to take that opportunity and have some fun. The superstar art team of Bryan Hitch and Stuart Immonen is in charge of amplifying and electrifying this rather unconventional ride into the sunset. In the past both guys have shown off the innate ability to make relatively small moments feel like really, really big deals, a trait which is exploited to its fullest during the aforementioned brawl. Hitch and Immonen thoroughly enrich the issue with their usual cinematic touch, although a dark, murky color palette often confuses many of the finer points of their efforts. Standing amidst the dust of Siege's final arena, I can understand the need for a dark, cloudy look. Dancing amid exploding walls and constant gunfire in the heat of battle, however, there's a bit less of an excuse. Great colorists need to know when and how to pull back and let the artists reach their audience, and in this case the palette is constantly standing directly in between the two. 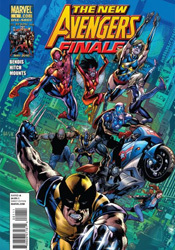 This issue marks the end of a long, emotional chapter for the Marvel U. It's the culmination and conclusion of everything that was set into motion way back in Avengers: Disassembled. And, for all the confusion and aggravation inspired by that story and the half-dozen crossovers that followed, in the end it's all come together into a single, perhaps too-neatly wrapped, little package. The ride wasn't perfect, but really, what is? Buy it.